It's Friday again! And, the last one of August... Here's my big 5 things of the week courtesy of Doodle Bugs Teaching. Have you seen this yet? Some awesome Canadian TpT sellers have been busy these last few weeks getting ready to go back to school! 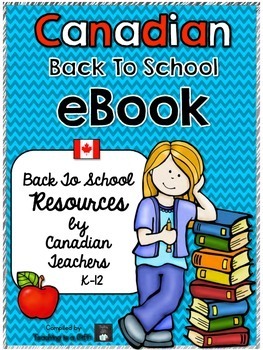 To help you get started or add to your planned classroom resources, we have created a collaborative eBook full of great teaching tips, products and freebies. You can find me on page 37. Have you noticed my new blog design? I know, I just did one myself not that long ago.... I liked it, but didn't love it. This one I love!!! I'm so grateful to Tricia Nae for her talents. Check her out guys! I'm really thrilled to tell you that I'm going to be doing a 7 week book study in the near future. At this point, it looks like there will be 6 of us sharing our thoughts chapter by chapter for "The Book Whisperer" by Donalyn Miller. I'm about half way through the book and really enjoying it. I've had a few "aha" moments for sure. Look for this series to be coming mid-September! I was able to tick two things of my To-Do list this week! My black vinyl arrived in the mail and I cut out everything I need. I also finished my mudroom sign! I painted a canvas blue.... the rest is paper and chipboard. I love how it turned out! The rubber boots are so cute! Last but not least, don't forget to enter Mrs. Beattie's giveaways! You can enter to win this bundle right here (it's the exact same link as the one on her blog) or go to Erin's blog and enter them all. Good luck! Those rubber boots absolutely MAKE the sign! It's so adorable! Your blog design is awesome. All of the designs and colors are really perfect together!